Aaron Clarke and Tommy Philp. The draperRACING team is set to be back to full strength for the next round of the British Supersport and Superstock 600 championships. 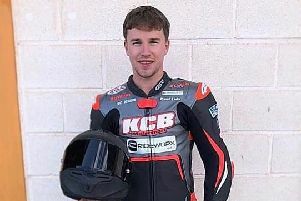 East Kirkby’s Tommy Philp added to his Supersport points tally at Knockhill and will be seeking further success at Snetterton in his two races, the Sprint race on Saturday and the Feature race on Sunday. The 22-year-old rider finished in the points in last year’s race and will be hoping to emulate that on Sunday. Teammate Aaron Clarke is expected to return to action at Snetterton over the weekend (June 30-July 2) after being forced to sit out the last race at Knockhill. Following his high-speed crash at Donington in practice for his last race, Clarke’s Yamaha as all but destroyed and a lengthy delay in delivery of the new parts meant the bike was not ready in time for the Knockhill race. Clarke, 21, from Kirton, scored points in last year’s race at Snetterton and will be determined to finish well inside the points on Sunday. In the British Supersport class there are two free practice sessions on Friday at 9.35am and 2pm, followed by qualifying on Saturday at 11.35am, ahead of the 10-lap Sprint race which is scheduled to start at 5.20pm. The warm-up on Sunday is at 10.24am and the 15-lap Feature race follows at 3.40pm. The weekend begins for the Superstock 600 with a free practice session at 9am on Friday, followed by a second at 1.25pm. The solitary qualifying session takes place on Saturday at 12.15pm and this will set the grid for Sunday’s race. There will be a short warm-up on Sunday at 9.10am which gives the riders a final chance to check all is well with man and machine ahead of the 12-lap race at 11.20am.